We offer Free Standard Shipping if you spend more than $124 or more on merchandise. Sorry, but this offer is not valid on orders shipped to Canada and gift cards don’t count towards the $124 total. ONCE I PLACE MY ORDER, WHEN WILL IT BE SHIPPED? Orders that don’t have any products that receive quantity discounts usually ship within 4 business days. Orders where you received a quantity discount can take up to 2-3 weeks ship. If you need your order sooner or for a specific date call or email before you order and we can let you know if we can get it to you by when you need it. Occasionally there is a discrepancy between what we think we have in stock and we actually have in stock, in such case we will email you with what is out of stock and give you options. Your order won’t be shipped until we hear back from you as we don’t ship orders that are not complete or in multiple shipments. WHAT ARE MY SHIPPING OPTIONS AND HOW MUCH WILL IT COST? FOR ORDERS THAT DON'T HAVE ANY ITEMS THAT RECEIVE A QUANTITY DISCOUNT? We have a standard shipping that is $7.95 if you spend from $.01 to $45.99 or $12.95 if you spend from $46 to $123.99 and doesn't have a guaranteed delivery date, thought it usually takes 2-14 days to get to you once we ship the order. We also offer Fedex shipping which the cost and options for shipping are based on the weight of your order and your zip code. The shipping options and the rate for each are available on both the shopping cart page and in the checkout process. If multiple orders are placed that are shipping to the same person at the same shipping address and being shipped with the same shipping method we reserve the right to combine the orders and ship them together. Transit times are based on the shipping method chosen. The following shows how long it will take your merchandise to reach you once we have shipped your order, not from when you place your order. Standard Shipping shipped via the Post Office or Fedex SmartPost, this usually takes 2-14 days to get to you. Fedex Ground can take 1-6 business days based on where you live in the country, but it is not guaranteed to be delivered by a specific date (we ship from Las Vegas). 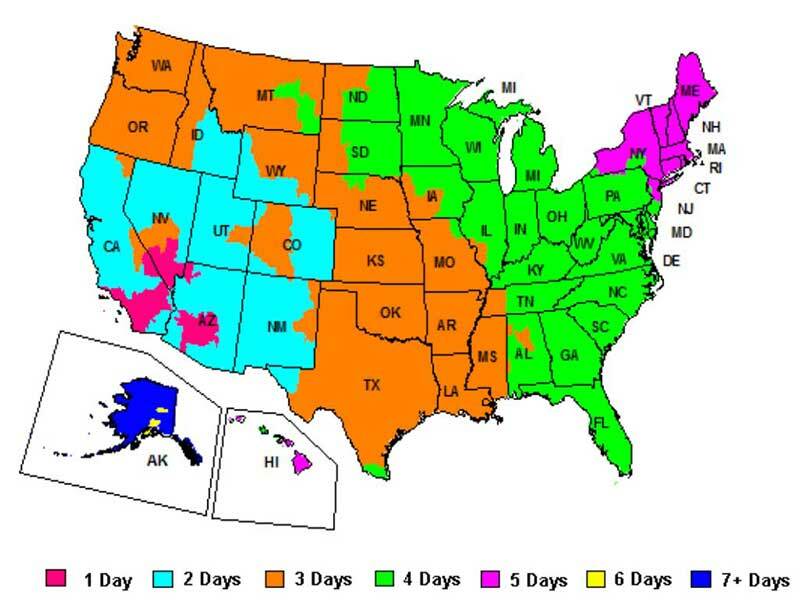 See map below for how many days it should take to get to you once its shipped. Fedex Next Day Air-Arrives 1 business day after it’s shipped. Fedex 2nd Day Air - Arrives 2 business days after it’s shipped. Fedex 3 Day Air - Arrives 3 business days after it’s shipped. USPS International Priority – This is the only option for orders being shipped to Canada. The U.S. Post office says it takes 6-10 business days to get to you once it’s shipped. FEDEX DOES NOT SHIP TO P.O. BOXES, BUT IF THERE IS A STREET ADDRESS IN THE ADDRESS AND A P.O. BOX, YOU ARE FINE. Orders shipped via Fedex can be tracked and have detailed delivery information. These services are not available for orders shipped via Standard Shipping. 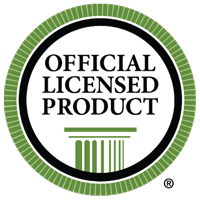 If you choose Standard Shipping as your delivery option and the package was delivered all claims must be made and taken up with the carrier and Sorority Specialties is not liable for any loss, damage, delay, incorrect delivery, fraud or theft. If the carrier says they have delivered an order but you have not received it, Sorority Specialties will not be able to resend or refund your order. We recommend you use Fedex. Fedex Ground days in transit map once orders have been shipped. For orders that receive a bulk discount many times we have to make in the merchandise to fulfill the order, so orders that receive bulk discounts can take up to 3 weeks to ship. If you need it sooner or for a specific date please contact us before you order and we can advise if we can get your order to you by when you need it. If you spend $124 or more on merchandise and your order is shipped to the continental United States you will get free ground shipping and the order will be shipped via FedEx. FedEx does not ship to P.O. Boxes, but if there is a street address in the address and a P.O. Box you are fine. For orders that receive a bulk discount shipping is 5% of the order total which is already in the price of the item (shipping is free for the customer, this is just done for accounting purposes).